Enjoy! The playing field has changed drastically for activists and organizers over the past few decades. The initially revolutionary tools of sit-ins, marches, and boycotts have become standardized and — let’s be honest — predictable. With media saturation reaching record levels, new avenues for protest have opened up. But at the same time it takes more and more effort to get even a brief moment of media attention. And the problems we struggle against are often less visible than they once were. Long-running oppressions like racism have shifted towards more subtle and covert forms, and newer issues like climate change can often feel invisible and distant. These changes have arguably led to a new wave of creativity in political action, from flash mobs and critical mass bike rides to viral videos and culture jamming. People across the globe are taking action in innovative new ways — drawing on a long history of creative protest, but also responding to uniquely modern opportunities and constraints. Through this process, activists have developed an enormous amount of expertise and knowledge about how to do effective and creative protest. 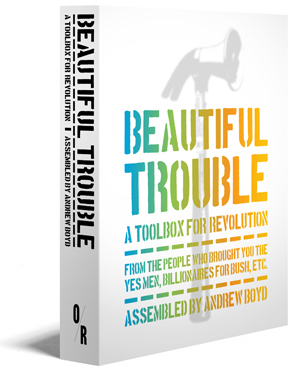 Beautiful Trouble: A Toolbox for Revolution seeks to gather together, in one place, as much of this dispersed knowledge as possible. In doing so, editors Andrew Boyd (of Billionaires for Bush) and Dave Oswald Mitchell have produced a true treasure trove of collective wisdom. Authors include activists from a wide array of organizations — including Code Pink, the Yes Men, Ruckus Society, Justice for Janitors, Rebel Clown Army, and the Coalition of Immokalee Workers — along with journalists, filmmakers, trainers, and researchers. Some of these authors have been in the struggle for decades, and here have managed to summarize their expertise into compact, easily digestible bits — with plenty of additional resources for those who want to go into more depth. The book is broken up into four parts. Section one, Tactics, includes descriptions of and practical advice about specific forms of public action — occupation, banner drops, invisible theater — as well as couple broader pieces on the concepts of direct action and strategic nonviolence. Section two, Principles, shares “hard won insights” about activism, such as “Brand or be branded,” “Make the invisible visible,” and (my favorite title), “No one wants to watch a drum circle.” Section three, Theories, does an impressive job of taking theories about social change — cultural hegemony, pedagogy of the oppressed, environmental justice — and summarizing them in ways that are practical and easy to read. Section four, Case Studies, offers examples of these tactics, principles, and theories in action. 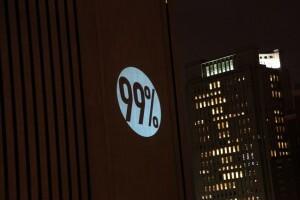 Cases include the Teddy-bear Catapult, the 99% Bat Signal, and the Lysistrata Project. The arts certainly have a significant presence in Beautiful Trouble. The book includes examples of forum theater, guerrilla videos, massive human banners, and lots of public performance. But many of the actions in the book are not “artistic” per se. 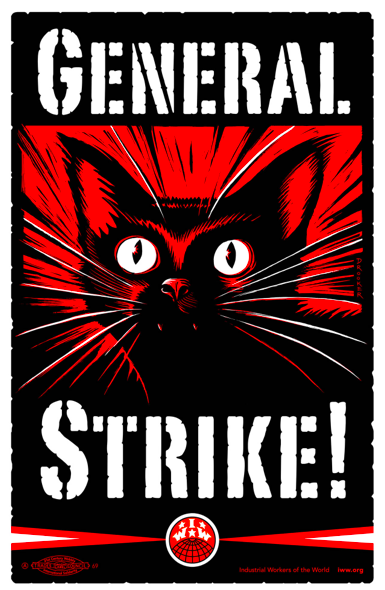 What they all share is a close attention to the form that protest takes. Authors advocate aligning the form of an action with its message, audience, goals, and overall strategy. They push a vision of protest that thinks beyond standard marches and rallies, to utilizing the broad range of tools open to activists. And they understands that political action functions at both the literal and symbolic level. Beautiful Struggle speaks to two cultural faces of social change. First of all, many of the chapters are based in an understanding of dominant culture. Mainstream culture is seen mostly as a target for social change, but also as containing a set of resources — memes, narratives — that are ripe for usurpation. Secondly, a smaller number of chapters touch onmovement culture, particularly collective decision making and addressing power relationships within organizations. What the book lacks is attention to the deep and powerful resources embedded in existing non-dominant cultures. A good addition might be a chapter on something like counter-storytelling, a narrative technique that draws on long histories of strength and resistance in marginalized communities. Because I didn’t want to miss anything, I read Beautiful Trouble in order, from front to back. But I do not recommend this method, because one of the best things about the book is its modular structure. Each short piece ends with a list of related pieces in the book, and web links to more resources. And if you are reading the ebook version (which I highly recommend for just this reason), these lists are hyperlinked. So you can wander, weaving between practice and theory, between the book and the web, forging your own path. The editors are planning to make all of this content available online, with additional pieces. And they are inviting others to submit their own cases, theories, tactics, and principles for online publication. So Beautiful Trouble will be able to grow far beyond the confines of the book, offering an evolving, collaborative, and ultimately invaluable resource for action. Paul Kuttner is currently a doctoral candidate, researching youth-led cultural organizing at the Harvard Graduate School of Education. He is a former theater educator — co-founder of Communities Creating Change in Riverdale, IL — as well as a graphic designer and cartoonist. Paul is one of the co-authors of, A Match on Dry Grass: Community Organizing as a Catalyst for School Reform, and a co-editor of the forthcoming volume, Disrupting the School-to-Prison Pipeline. He is currently working on a year-long qualitative study withProject HIP-HOP, a youth cultural organizing group in Boston, MA. Beautiful Trouble’s website. And go to the new feature, Explore Beautiful Trouble, that makes for fascinating learning. Search for places and phrases, for example, buy local, and see what creative folks have done to make the world a better place. Brace yourselves, Evil Empires! Trainers are standing by! Now there’s help for your nonprofit or cause. The Trainer Corps is ready “to come to your campus or community for a hands-on training.” Covering areas such as: Creative Direct Action; Arts & Action; Organizing 101; Humor, Pranks & Disruption.